Sometimes you need a tool that looks and acts like a spreadsheet but is more powerful and acts like a database. That’s the core of what AirTable does. It provides a familar user experience from spreadsheets, but additionally, you get a few more sophisticated ways for information management and for advanced functionalites. While AirTable does have some paid features and a space usage limit, I’ve found the free version perfectly suited for my needs so far. AirTable provides a way to create a range of rows and columns, much like you would with any spreadsheet. The columns are actually fields much like in a database. You can have fields or columns for different data types (text, numbers, selection, list, etc.). Importantly, you are also able link together multiple tables into pretty complex structures. This means you can have use something like reference tables. This allows for dynamic fields, do ingcalculations and lookups, and forming aggregation tables. This makes it possible to organize any type of information and to create specific tools to manage that information through tailored processes and workflows. For example, for me, it works great as a CRM or customized project manager among other things. A complete introduction to AirTable is outside the scope of this post. If you need help, their site has tons of blog posts and tutorials as well as several useful examples to you can clone and start using. We have a table dedicated for goals and another for time periods. These then get linked and more specific when we create goal pursuits. In a technical sense, what we are doing is using two tables (goals and time period) and creating a third table (goal pursuits) to manage the relationship between them. These are call join or junction tables, and they allow us to track aspects of that thing-in-between, i.e. our goal pursuits. If you are confused or interested in understanding this concept, check out AirTable’s A beginner’s guide to many-to-many relationships. There are a lot of tools out there that help you track different aspects of your life, like tasks, time, projects and various health metrics. I’ve used and talked a lot about them in my attempt at tracking everything. While there are some that explicitly claim to track goals, like Beeminder, the reality is that they only track certain outcomes towards a goal, like kilometers run, pages read, etc. None of them track the goal pursuit process. Goals require multiple projects, tasks, and pursuits as we advance towards them. Most goals take time and involve several action stages. 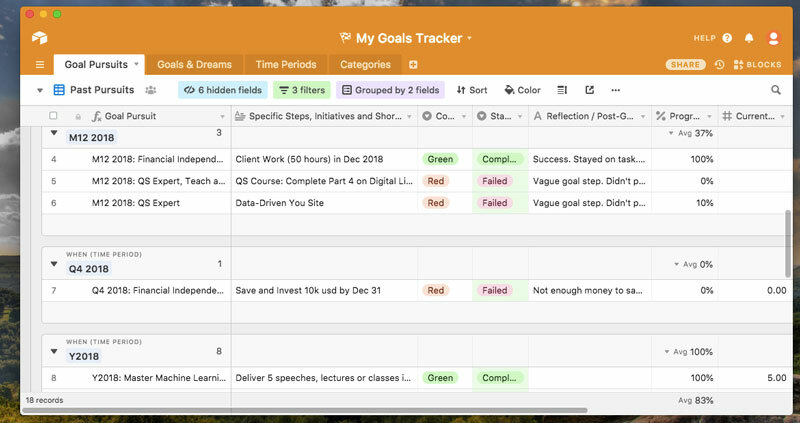 If we want to track that process and even better improve our pursuit, then we need a tool that helps use better organize and track goals as a process, rather than just a static list of dreams. For that reason, I created Goal Tracker for AirTable. The primary aim of Goal Tracker is to help you track the organizational aspects of your goals and goal pursuits. You keep a list of your goals and formulate goal pursuits from that list. You can then add and update additional information related to them over that time period. Goals & Dreams: This where you store your typical idea of a goal or dream. You note what it is and can add a description and category, if you like. We use this table as a reference in our goal pursuits. Time Periods: This is a simple calendar-like structure, which provides the brackets of time in which you plan to work on a goal. Goal Pursuits: This where the goal action happens. A goal becomes a goal pursuit when you assign it to a time period, get specific, and start working on your goal. A good, science-backed goal pursuit is specific and measurable. You state what you’ll work on and when, where and how you’ll work on it. Goal Tracker is all about helping do just that. 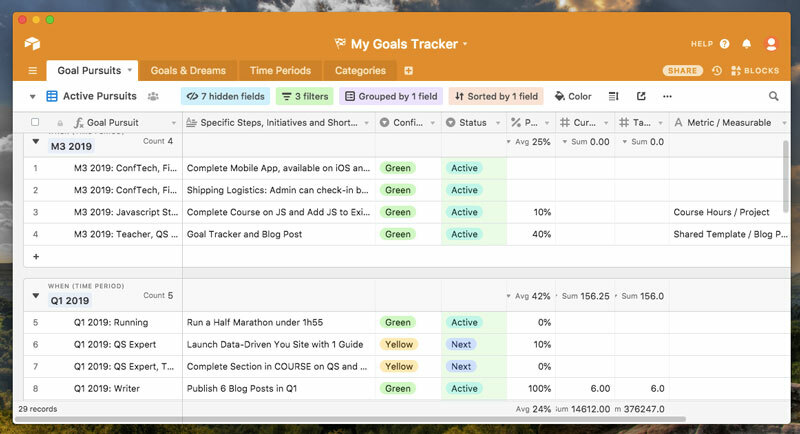 When it comes to Goal Tracker, the Goal and Dreams list should NOT be considered its primary functionality. This is just a place where you store a list of all possible things you might work on. You are really just storing your goal intentions. These are typically abstract targets of desire. They might be dreams and fantasies we hope to one day acheive, like write a novel or travel to Paris or they could our identity (Writer, Teacher, etc.). It might also be a defined purpose or personal mission. They might maybe-things and actual things we are engaging in. While often conflated, it’s important to distinguish between a goal intention and goal pursuit. A goal intention is the thing want, while a goal pursuit is our cumulative actions and plans towards attaining that goal during a certain time period. When it comes to tracking and organizing your goals, this distinction is critical, because if you tell yourself you have a goal but never pursue it, then it’s just wishful thinking. 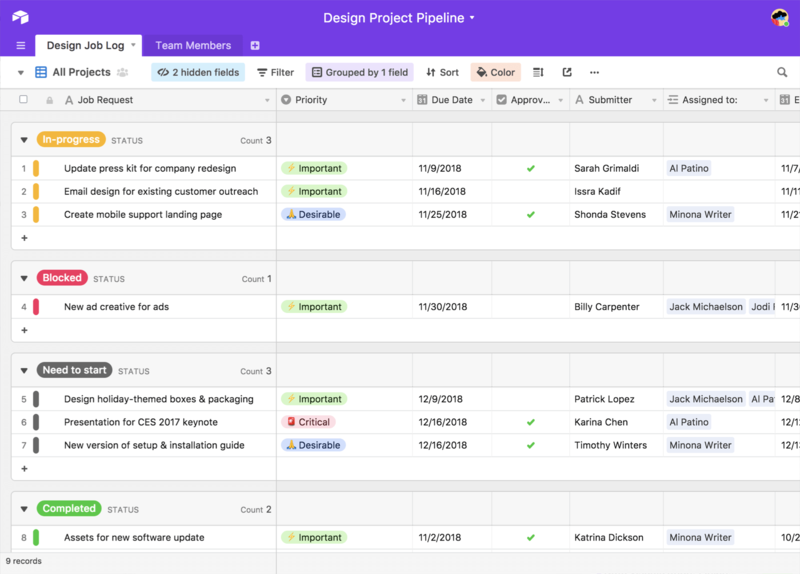 Beyond just keeping a list, you can use AirTable to help you organize and prioritize your high-level goals. For example, you can use Buffet’s 5/25 rule to come up with goal areas of your life to prioritize and areas you need to ignore. Additionally, you can use categories to see if you have the balance you want. Most likely you already have a list of goals, so transfer some of them into the system. As you come up with new goals or need more sorting, return to this list. Remember the point is not to obcess about your goals but to use these goal intentions as the starting point for formulating specific goal pursuits. One big reason why many goals fail is because you never defined the when. You simply stated a goal intention but haven’t provided a specific when, where and how. This problem is most accute with yearly goals, since we can continually tell ourselves later this year until we reach Dec 31st! So, while it’s okay to have yearly goals, it’s better to define a goal pursuit on shorter time frame that forces you into action and allows less procrastination. 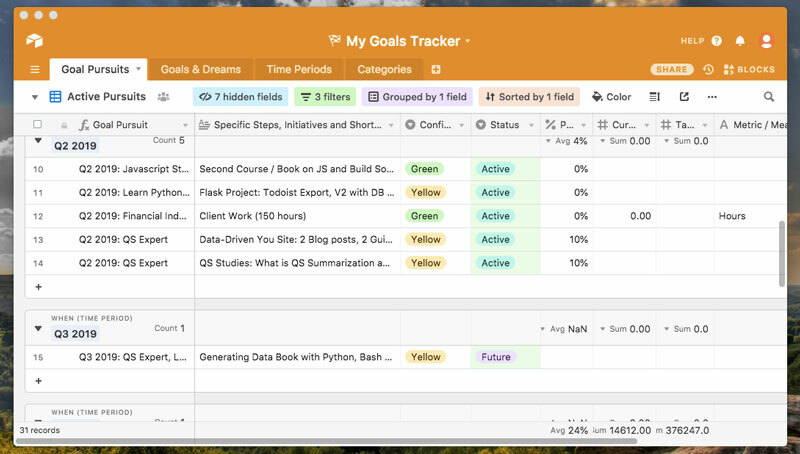 Goal Tracker helps you by ensuring all goal pursuits define a time frame. You basically need to include a time frame if you want to create a goal pursuit. Time periods in Goal Tracker are flexible. They might be weekly, monthly, quarterly, yearly or anything you like. I tend to focus on monthly and quarterly goals, so in the template I’ve provided examples of those. In order add your own just creat new item or add a row in the bottom. Add a clear name and then include a start and finish date. After that, you can then assign it to a goal pursuit. 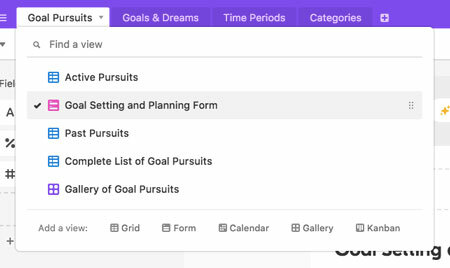 Goal Tracker for AirTable is designed around helping you focus on goal pursuits. One of the reasons why many goals fail is because they existed only as a goal intention. It was something you may have wanted but not enough to actual pursue it. I’m not even sure it’s fair to call them goal failures, since you never really worked on them. This is why in the science of goals we make a distinction between a goal intention and goal pursuit. For anyone working on their goals, your main objective should be your goal pursuits. The form is not necessary and merely provides a bit more context and help about the different fields and the science behind them. Now that we understand how Goal Tracker for AirTable works, I’d like to share a few aspects on how to use it. To reiterate, the primary aim of Goal Tracker is to help you track the organizational aspects of your goal pursuits, like which goals you are working on, assigning time periods and recording various properties related to them. There are a lot of different ways you might use a tool like this. AirTable makes it really easy to modify it to how you work best or a specific aspect of goal techniques you want to apply and track. What are your wishes, dreams and desires? These are your goal intentions or more commonly just called your “goals.” Record them in the goal and dreams table. In GTD parlance, do a brain dump of your goals. Additionally feel free to brain storm and add categories and goal pursuits too. You can organize them after. This is the “because” or motivation behind your goal pursuit. There is a good amount of research showing how critical motivation is to successful goal pursuits. One powerful technique mental contrasting which can be useful in this predecision, pre-action phase since it forces you to figure out both the drive behind the goal and obstacles in the way. You don’t necessarily have to formally do this inside the tool, but a field has been provided so you can. What is the specific thing you will do? How, when and where will you do it? Once you decide on a goal, it becomes a goal pursuit. The key task then is figuring out specifically what you are going to do. There is a required and central field here to note the specifics of your goal pursuit. It could be a one-liner or it could be a few points. Ultimately you aim to plan habits, initiatives and goal-striving actions. When are you will you work on this goal? Which time period, month or quarter? For a habit, which time of day? For all pratical purposes, a goal pursuit is something you are planning or acting upon during a certain time period. So, one key action I’ve learned around managing my goals is scheduling that goal pursuit within a certain amount of time. This act of scheduling forces me to figure out blocks of time that will allow me to advance that goal. If I can’t find the time or have scheduled too many pursuits in one period, that goal pursuit will fail or perform poorly. Goal Tracker makes it pretty to visualize just how many goals you have scheduled in some time period. You can look back in the past to see what balance worked for goal attainment. You can then adjust current goal pursuits and even move items into a different future time period. The point is to find the right balance of things to work on in the short-term but in view of necessary steps you can work on later. Am I confident in my goal pursuit? Where do my goals stand? Is there a measurable? What’s my target and current number? How much progress have I made? These are a few questions you might use to track a specific goal pursuit. There are many others and you can easily add or modify according to how you want to do it. For now, I’ve included a modified technique from Google’s OKR goal system to track your goal pursuits. These provide a good starting point since it measures both the confidence you have and some way to gauge progress. Goal Confidence: How confident are you of goal pursuit success? Green = All good, continue on. Yellow = There is an issue and something needs looking into. Red = Failing or Failed. Goal Status: This is a simple field to mark if a goal is active, completed or some other project management status. Goal Metric: If the goal pursuit can be tracked with a number, then the goal metric or measurable is the thing you’d be measuring, like Blog Posts Published, Miles Run, Sales Numbers, Money Saved, etc. Goal Target: This is the target number of your mesurable. For example, 50 km, 3 blog posts, $1000 savings, etc. Current Number: This is a simple way to note your current measurable numer. Progress Percentage: This is a way to track your progress. If the goal is meaurable, then this your current number divided by your target. If it isn’t really possible to measure, then just subjectively note how close you are as a percentage. These fields provide a solid first step towards goal tracking as a pursuit. They let you note both how subjectively confident you are about a goal and a few ways to objectively measure your progress. Depending on the goal pursuit, tracking might be something you do regularly or you might just do it periodically along with your weekly or monthly review. Since our focus is on tracking the goal process rather than a single metric, it isn’t the most sophisticated system. This is one area for possible future improvement of Goal Tracker so we can update our progress using data collected from external trackers. What goals did I work on? How did they go? What did I learn? Goals can and should come to some form of endings. During these ends, it is helpful to take a look back to review and evaluate how those goals went. I’m a big beliver in the power of consistent reviews, especially weekly reviews. Reviews allow you to check-in and reflect on how a certain period went. They allow you take a step back and see your high-level process worked, and then think forward towards what you might change or do better in the future. It also can be a stress-reliever. When it comes to goals and goal pursuits, the review and evaluation phase can be used to help you learn a few things about you and your goals. The first thing it helps with is just giving yourself a chance to review how well you did in pursuit of that goal over a certain period. Did you reach your goal? How did it go? This reflection should combine both postive aspects, like lessons learned and what you are most proud of, and negative aspects, like what went wrong or ways you might improve going foward. The second thing a goal review does is it allows you to transition from one goal pursuit to the next. While goals might take months or years to reach, goal pursuit research indicates the importance of avoiding goals that are too distal, i.e. to far in the future. Instead, the best strategy is to divide up that pursuit into a series of “missions” or initiatives over time. This is why Goal Tracker emphasizes goal pursuits segmented into time periods. By breaking down your abstract goals in sub-goals and specific projects, you can manage and develop them over multiple time periods. You build up a chain of positive steps and and develop skills towards getting to that goal. This breakdown visualizes goal pursuits in reverse chronologial order and you can add your reflections and notes accordingly. You might do them in the tool using a dedicated field or elsewhere in a separate notebook or notes tool. I recommend scheduing periodic check-in’s to track progress and review your goals. Personally, each year I spend some time setting my yearly goals and I then attempt to translate them into monthly or quarterly objectives. For some goals, I schedule them later in the year. I mostly work and review my work on a weekly basis. I set 1-2 big project objectives each week and 2-6 smaller step goals too. I then do roughly a 3-6 week goal cycles where I review and log my progress and I revise my goal pursuits. Ultimately you’ll never acheive every goal you set but hopefully by using a tool like this you can better align, organize and schedule what matters and set specific objectives across time. In turn, you get a clear log of what you did and when. You know which goals fell through and which progressed. For me that’s the power of having a goal tracking tool like this. 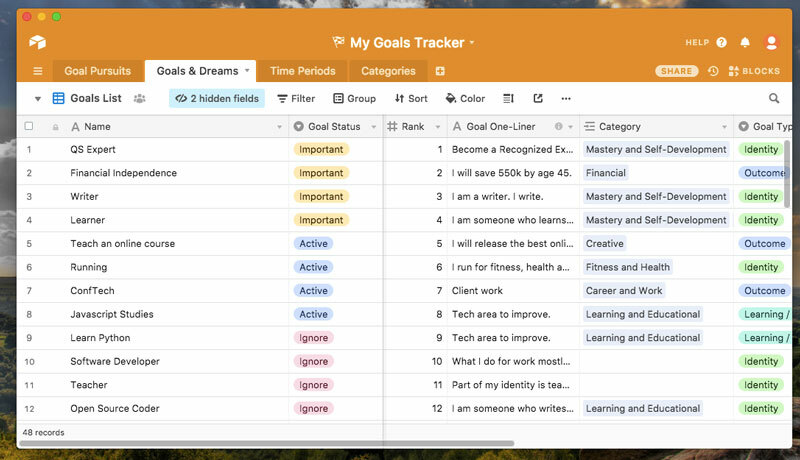 Goal Tracker provides a focused tool for keeping and prioritizing a list of your goals and dream and for converting those fantasies into action-oriented goal pursuits. In this post, we did a pretty high-level look at the tool I’ve built using AirTable. Its primary purpose is to help you organize and track multiple goal pursuits over time. By splitting goal intentions from goal pursuits, you get better at focusing on the later while keeping a sorted list of the form. In turn, having a log of your goal pursuits allows you to apply key techniques at different stages from the science of goal. This gives you a record of your goal pursuit history and allows you to improve your efforts at pursuing and obtaining your goals. It’s also fully customizable so you can modify and augment to fit your needs and apply what you find works best in pursuit of managing and reaching your objectives. To conclude, I want to talk a bit about the motivation behind why I build this tool and how I personally use it and the scientific principles behind it. Arguably the best strategy when it comes to goal pursuits is radical and complete focus. Have one singular goal, maybe two, and dedicate as much of your energy, time and self into it. In this goal pursuit situation of a singular goal and singular focus, you can largely forget about goal organization or management. 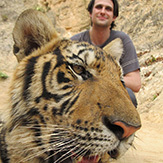 Just focus on completing the next best actionable items and acheiving desireable outcomes that move your goal forward. Work until that goal is complete, and then find a new goal. Rinse and repeat. Unfortunately, the reality is that many (myself included) have and will have multiple goals at the same time and across our lives. We all know it’s better if you stick to one or two things, but as Robert Heinlein put it a famous quote, “Specialization is for insects.” I believe a happy, passionate and commited human life is one where we all have and should have lots of goals, both conscious and unconscious. We are overly ambitious creatures. We have big dreams, goals and things we want to reach. Having multiple goals and goal pursuits over time is one of the key assumptions I applied to building this tool. The tool is built to allow you to express and capture each and every goal you might have. In turn, it helps you to think about and transform the goals that do matter into action-oriented goal pursuits. For me this transformation of goals into goal pursuits is crucial if we want to improve our goal processes. Many will fail and that’s ok, but a few will succeed as we discover something we believe in truly and, with a bit of luck, something that works out successfully. But to get to those driving goals and passions is a process of trial and error over time. We need to approach our goals and search for purposes as a multiple stage process involving various goal pursuits over time. Goal Tracker is largely my expression and attempt at organzing, managing, and tracking the pursuit of multiple goals over an infinite time frame of a human life. Being overly ambitious is okay, but it’s better if we use a tool to help us undrstand our goals better and get more of these goals accomplished. This is especially true for complex goals involving a long time frame and ambigity about is the next best thing to do. Hopefully Goal Tracker can help you in reaching your short-term goal pursuits and driving at your deeper life purposes. It’s certainly helped me in mine. Best wishes and happy tracking!